It’s only played a handful of previews thus far, but I’m hearing wonderful word-of-mouth about the new production of Cinderella at the Broadway Theatre. State Fair and Cinderella aren’t usually included in the mix, because they weren’t originally written for Broadway; the former, of course, was a movie that was made twice, while the latter was made thrice for small-screen viewings. Since then, multiple stage productions have spanned from west coast regional theaters to New York City Opera. But not until now is Cinderella making her Broadway debut. If you’re the type of theatergoer who likes to recognize the tunes before you attend a show, two albums will acquaint you with the excellent score. The third production, starring Brandy (Norwood) and Whitney Houston in 1997, didn’t get a soundtrack, some allege, because the two stars’ different recording companies couldn’t agree to terms. No one can say for sure how many of that 107 million were disappointed, but a good guess is, as Charley Kringas says in Merrily We Roll Along, “Damn few.” Those who couldn’t get tickets to My Fair Lady, then in its second year, were glad to have the opportunity to see this Julie Andrews that all of Broadway had been talking about. Here too she would play someone who starts out unglamorous and winds up patrician. This was Andrews’ third original cast album, following The Boy Friend and My Fair Lady. And, yes, this Cinderella IS an original cast album and not a soundtrack (which literally means taken from a track of sound); it was recorded in a studio a dozen days before the show aired. Andrews sings part or all of seven selections. Her silvery voice is marvelous from the outset, when Cinderella sings that she’s “In My Own Little Corner.” In it comes the quintessential example of Richard Rodgers famous “wrong note” – the bit of music that sounds both strangely dissonant and flat until you realize that you wouldn’t have it any other way, for it makes the melody compelling. Look for it on the second “own” in the title phrase. The cast was a lovely mixture of the past, present and future. Howard Lindsay, a co-creator of Broadway’s longest-running play (Life with Father) was hired to play the King by the creators of the then longest-running Broadway musical (Oklahoma! at 2,212 performances — now only enough to get it to 26th place on the long-run musicals list). As his Queen was his real-life wife Dorothy Stickney, with whom he starred in Life with Father. They got a nice comedy number in “Royal Dressing Room Scene,” which shows that in the end, regal spouses have the same arguments as every other husband and wife. Ilka Chase, who made a career of playing elegance before she wrote a tell-all book, gets to show her darker side as Cinderella’s stepmother. Playing her own daughters are Kaye Ballard, who’d made an auspicious Broadway debut on The Golden Apple’s opening night with “Lazy Afternoon” and Alice Ghostley, previously a New Face of 1952. R&H and director Ralph Nelson must have greatly wanted Ghostley; she was then in rehearsal for a new stage musical version of Tom Sawyer called Livin’ the Life. (It would live a life of only twenty-five performances). 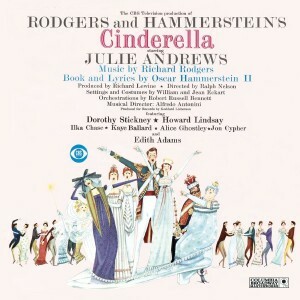 Ballard and Ghostley sing “Stepsisters’ Lament,” which shows how clueless the two are in not knowing why a Prince wouldn’t choose either of them and why it must be Cinderella. Rodgers obviously believed in his melody; it almost entirely made up the show’s overture. Cinderella’s Prince was cast with a rank beginner: Jon Cypher, who had neither Broadway nor Hollywood experience. After that, Cypher acquired good roles in the smashes Man of La Mancha and 1776 and in the less successful Big and Sherry! Here he offers a most pleasant baritone. Portraying Cinderella’s Fairy Godmother was Edie Adams, then in her fourth month as Daisy Mae in Broadway’s Li’l Abner. Some say that Adams was too young to for the role, for she hadn’t even reached her thirtieth birthday. She was only eight years older than Andrews, too. However, while a girl must wait a number of years before she can become a mother, she can become a godmother (especially a fairy one) at any age. And although Town Crier still has “Gregory” and “James” to go, the crowd interrupts him to ask in astonishment “Herman?” It doesn’t sound regal, especially when compared to those other lofty names. Hammerstein adeptly repeats the joke when Town Crier delivers a litany of the King and Queen’s names that respectively include the seemingly gauche “Sidney” and “Maisie.” The laundry list would have been a little boring without these jokes – except that Rodgers’ melody is majestically appropriate and (of course) tuneful. And then there are those waltzes! No one in musical theater wrote better in three-quarter time than Rodgers, and here he shows he was still the master of the form with two blue-chippers: “Ten Minutes Ago,” which has Cinderella and the Prince start their relationship, and “Waltz for a Ball,” which has them deepen it. They move into 4/4 with the show’s most popular standard: “Do I Love You Because You’re Beautiful?” the Prince sings, before he asks a more pertinent question: “Or are you beautiful because I love you?” The song has been recorded dozens of times, including by ‘50s crooner Vic Damone, whom Rodgers had originally earmarked to play the Prince in the broadcast. Rodgers, of course, could compose well in 2/4 time (“Stepsisters’ Lament” and “Impossible”) or “common time” (“In My Own Little Corner” and “A Lovely Night”). But there was nothing common at all about Cinderella. Do we love it because it’s beautiful — or is it beautiful because we love it? The former, friends, the former.